There are as many forms of exercise these days as there are flavors of ice cream. That may be an exaggeration, but not by much. When I was a kid, exercise was pretty straight forward: You went to gym class, ran around the neighborhood with your friends and rode your bike just about everywhere. Now it’s a bit more complicated than that. First of all, most adults don’t run around the neighborhood (maybe they do, but that’s another topic) and exercise has to be fit into very tight schedules. People are busy with work, family, social activities etc. Most people don’t have a lot of time to just exercise. So for that reason, exercise needs to be productive. So what makes for that perfect work-out? In all fairness, there really isn’t just one ‘perfect’ way to work-out nor are results instantaneous (wouldn’t that be nice?) A person has to really like what they are doing or they won’t stick with it. Most people also want to see some results and that means not only looking better, but feeling better too. A great work-out would include some cardio, strength training and flexibility exercises. It should also be varied and fun and be adapted to the level of expertise as well as the body type of the participant. In other words, the work-out would be individually designed for the participant. Now that’s pretty darn perfect. So why Pilates? 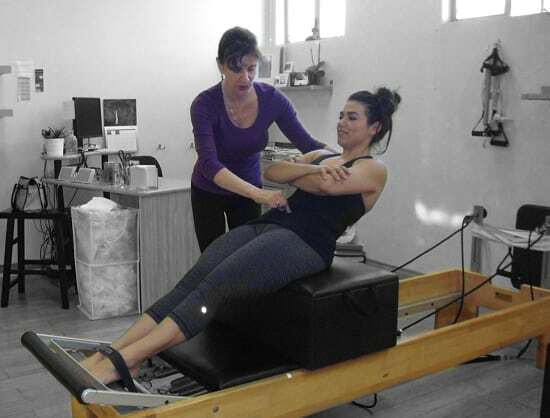 I tell my clients that Pilates has both strength training and stretching along with a big dose of body awareness that helps the client with many other activities. Do Pilates twice a week and see your golf game improve. Practice Pilates once or twice a week and run faster and you are less likely to hurt yourself. So not only does Pilates help to strengthen your body, increase flexibility improve posture; it also makes you do everything else you do better. Pilates is also one of the best anti-aging work-outs there is. Nothing ages a person more than poor posture. Botox is nice, but great posture is even better. There isn’t really a perfect work-out, but Pilates comes closer than anything else. Try your first Pilates session at Ab-solutely Pilates – a private home studio nestled in the heart of Huntington Beach CA. I have worked with Devra for several years. her classes are fun and she personalizes the exercises to each student. With her help, I’ve gained strength, and improved both my posture and balance. Absolutely Pilates is the best. Pilates is a great exercise for my chronic low back pain and since it helped me, I have referred many of my patients to Devra. The most important thing is that it’s an awesome form of exercise to help with the stubborn ‘menopause pooch’. All Pilates sessions are by apointment only. © Ab-solutely Pilates 2019 | Theme: pilates-flow by Anastasiya Goers.